YARDLEY, PA. – Global Traveler, the only AAM-audited magazine for luxury business and leisure travelers, releases the results of its 15th annual Wines on the Wing Airline Wine Competition. Photo from 2017 competition, Global Traveler. The competition, held May 31, took place at The Pierre, A Taj Hotel, in New York City. Expert judges participated in the blind tasting of 22 airlines’ white, red and sparkling wines. The judges hailed from a wide range of specialties, including sommeliers, wine shop owners and winemakers. In total, 18 Champagnes/sparkling wines, 39 white wines and 39 red wines were tasted. Airlines are required to submit five different wines — two red wines, two white wines and one sparkling wine/Champagne — to be eligible for the overall Best International Business-Class Wines on the Wing award or the Best International First-Class Wines on the Wing award. This year, the winner for Best International Business-Class Wines on the Wing was Delta Air Lines, and the winner for Best International First-Class Wines on the Wing was All Nippon Airways. In the white wine category, Best International Business-Class White Wine was La Capra Chenin Blanc 2016, South Africa, submitted by Aeroflot. For first class, the winner was EL AL Israel Airlines with Yatir Winery Viognier 2015, Israel. The best business-class Champagne was American Airlines’ Lanson Black Label Brut, NV. The best first-class Champagne was All Nippon Airways’ Krug Brut Champagne 2004. When it came to red wine, American Airlines reigned supreme in the first-class category with Valduero Reserva 2012, Ribera del Duero, and United Airlines took the No. 1 business-class spot with Les Graviéres du Roy Sauvion 2016, France. For the 10th consecutive year, Global Traveler awarded the Best North American Wines on the Wing. North American airlines submitted first-class and business-class wine samples, depending on their domestic flight offerings. American Airlines was named Best North American First-Class/Business-Class Wines on the Wing, and also won for its red wine, Raymond Cabernet Sauvignon 2014 Reserve Selection, Napa Valley, California, and its white wine, Joseph Drouhin Pouilly-Vinzelles 2015, Mâcon, France. JetBlue’s Raventós de Nit Brut 2015, Spain, won Best North American Champagne/Sparkling Wine. For the seventh year, Global Traveler awarded the Best Alliance Wines on the Wing. The participating airlines were divided by airline alliance. The overall points for each airline were tallied and averaged to determine the alliance with the highest total. Congratulations to oneworld, represented by American Airlines, LATAM and British Airways. Competition director Eunice Fried spent months preparing for the blind tasting. 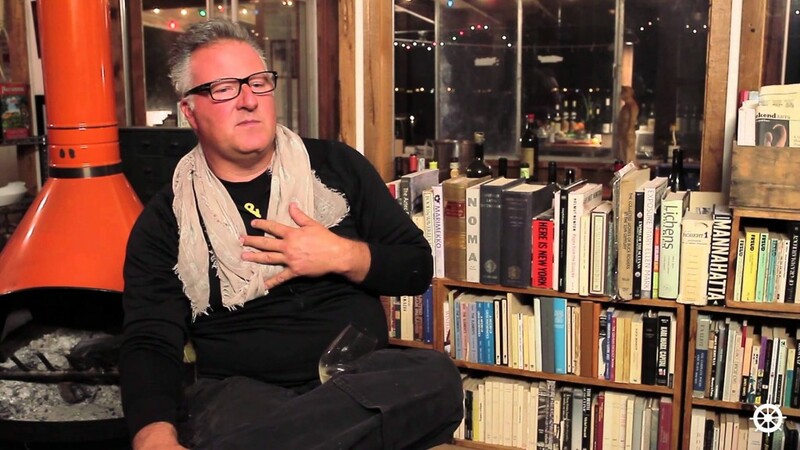 Fried, an accomplished wine journalist and respected wine expert, resides in New York City. Global Traveler is the only U.S.-based publication to conduct such a survey in the United States. For more information on the competition, check out the August 2019 issue of Global Traveler or visit globaltravelerusa.com. With nearly 300,000 readers, Global Traveler connects with U.S.-based frequent, affluent, international travelers. According to MediaMark Research (MRI), GT readers have an average net worth of $2 million and 50 percent are CEOs and owners of companies. Our readers average nine domestic flights per year and 93 percent travel internationally on a regular basis, mostly in first and business class. More than 55 percent stay in 4- and 5-star hotels, at an average 60 nights per year. Four special editions — Leisure Lifestyle Edition, Global City Guidebook, Class Act Guide and The Trazee Book — complement 12 monthly issues. Each year, Global Traveler awards the GT Tested Reader Survey awards, the Leisure Lifestyle Awards and the Wines on the Wing awards. Global Traveler’s website, globaltravelerusa.com, which unveiled a new design in late 2016, offers unique daily content catering to the lifestyle and travel interests of our audience of premium travelers. Other digital offerings include eFlyer USA (20,000 double-opt-in subscribers); eFlyer Asia (4,000 Asia-based, double-opt-in subscribers); custom e-newsletters; sponsored content; Publisher’s Picks, GT on the Go and Premium eDeal e-newsletters; and a weekly On the Road with Global Traveler slideshow. More than 1 million visitors monthly rely on globaltravelerusa.com as their travel resource. FXExpress Publications, Inc., based in Yardley, Pa., is a privately held company publishing Global Traveler, eFlyer USA, eFlyer Asia, Trazee Travel, WhereverFamily and several annuals; and also operating globaltravelerusa.com, globaltravelerusa.com/blog, trazeetravel.com, whereverfamily.com and FX Excursions. 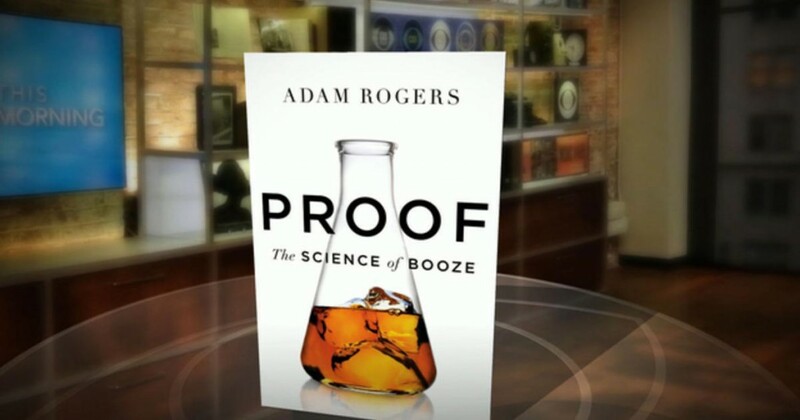 How yeast and sugar help turn practically anything into booze. “Well” drinks were traditionally poured from the lower “well” under the bar while the “top shelf” liquors are on the…top shelf. What is peat and how does it affect your Scotch? What does the term “microbial terroir” mean? You can make booze from sugar beets. Sake, that was developed before wine, was originally chewed. Why copper is used for stills. How music and movement effects the “Angel’s Share” that can be lost during barrel aging of spirits. What a Cooper puts into making a barrel. The placebo effect on drunkenness. Aroma – clean, apricot, lemon, wet stones, pink rose petals…open to your own interpretation. Taste – Lime, apricot with medium acidity. Bottle did not give grape varietals. A Google search suggested that it may be a blend of Muscadelle, Sauvignon Blanc and Semillon. Aroma – Butter, oak, jasmine and honeysuckle. Flavor – Grapefruit, banana and oak with a medium acidity. 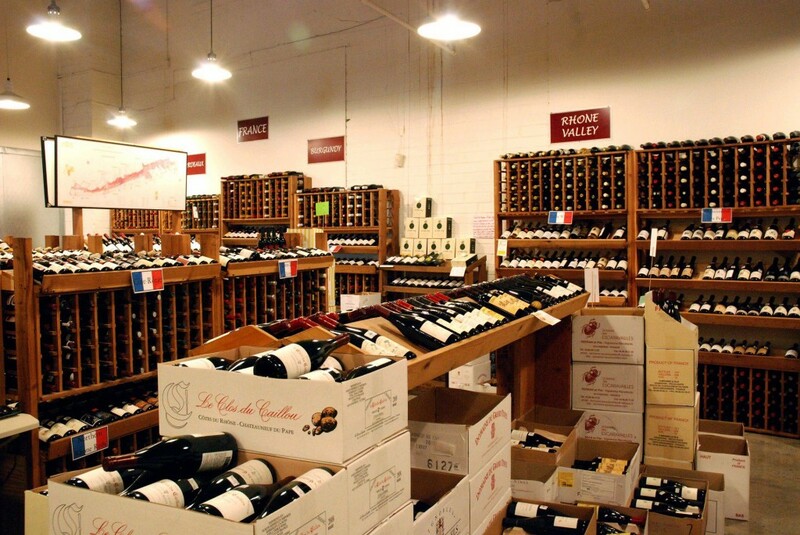 The Wine House is thrilled to be named one of ten of the “World’s Best Wine Shops“ in Food & Wine! 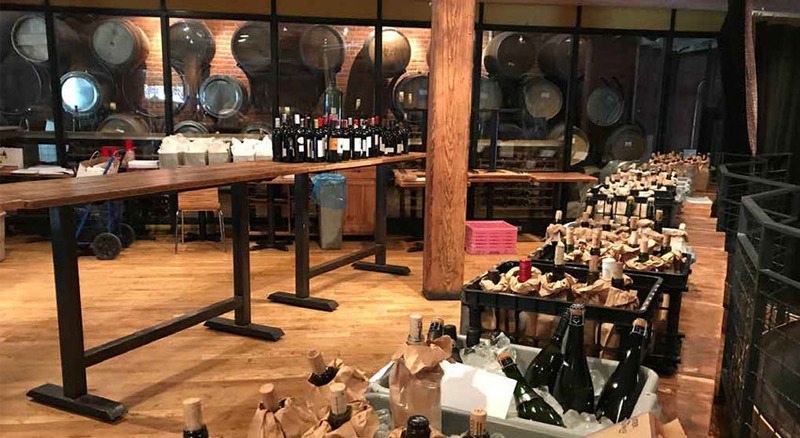 In addition to being described as a “wine geek’s dream destination” with modest markups and excellent small-production offerings, we were noted for having “an impressive lineup of classes.” Here are our current offerings! Click below to see ALL Wine House classes and events! Paso Robles, CA – Tickets for Paso Robles Wine Country’s marquee events are now on sale at www.pasowine.com. Blendfest on the Coast brings blended wines of Paso Robles to Cambria and San Simeon, February 9 – 11, 2018. The annual celebration of Paso’s heritage variety, Vintage Paso: Zinfandel Weekend is scheduled for March 16 – 18, 2018. Paso Robles’ signature wine event for 36 years, the Paso Robles Wine Festival takes place on May 17 – 20, 2018. With all three events on sale at the same time, it’s a one-stop shop to plan for 2018. Blendfest on the Coast kicks off with a winemaker dinner at Indigo Moon restaurant on Friday, February 9, showcasing Paso Robles blended wines with winemakers pouring. Saturday, February 10 features a two-session walk-around tasting within one of the most exclusive venues on the coast, the Hearst Ranch property overlooking the San Simeon bay. Each session offers limited tickets, creating an intimate tasting where everyone has an opportunity to spend time with the winery representatives. This event will have a charitable element, raising funds to benefit those impacted by the southern California fires. Blendfest continues Sunday, February 11 with a winemaker led blending seminar, letting audience members try their hand at the art, and science, of blending wines. Blendfest on the Coast is presented in conjunction with Visit Cambria, Visit San Simeon, and the California Highway 1 Discovery Route. Vintage Paso: Zinfandel Weekend begins on Friday, March 16 with Zinposium, a Zin-focused seminar in downtown Paso Robles at the Paso Robles Inn Ballroom. 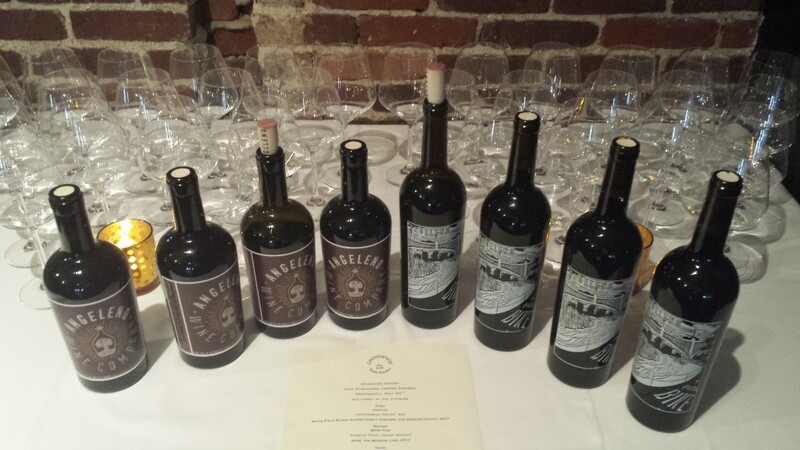 Moderated by iconic winemaker, Wes Hagen with J.Wilkes Wines, a panel of winemakers will share some vintage stories to go with their Zinfandel and Zin blended wines. 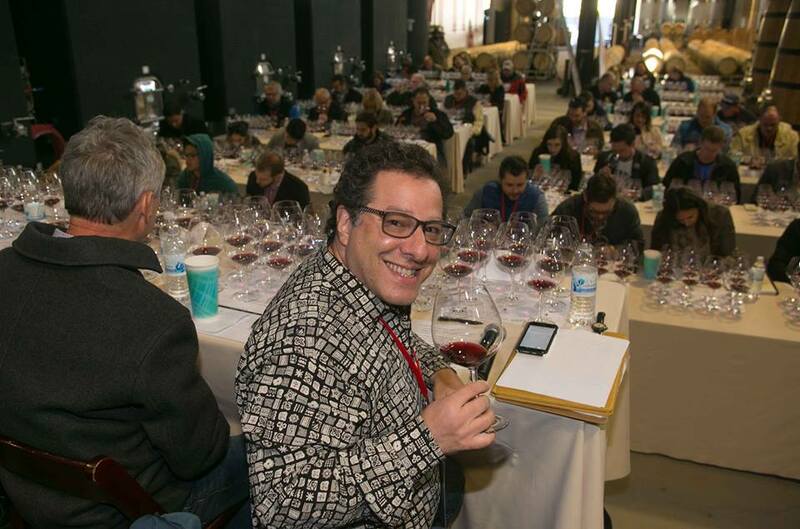 This seated tasting is guaranteed to be educational and entertaining. In the evening, the ballroom transforms into a lounge atmosphere for Z After Party. Join up to 20 Paso wineries for a savory walk-around Zinfandel tasting, complemented by a fantastic selection of desserts and live music by the Darrell Voss Trio. This intimate tasting is sure to sell out with 80 seats for Zinposium and 175 tickets for Z After Party. Advance purchase only. Zinfandel Weekend continues on Saturday, March 17 and Sunday, March 18 with more than 100 wineries holding their own individual events throughout Paso Robles Wine Country. Visit www.pasowine.com to search by winery, activity or day to plot a course for fun. The Paso Robles Wine Festival returns May 17 – 20, 2018 with the 36th annual celebration of everything Paso Robles wine. Wine Fest kicks-off Thursday, May 17, 2018 with Winemaker Dinners, each featuring multiple winemakers at the table with their wines paired with the cuisine of two iconic Paso Robles restaurants, Thomas Hill Organics and The Hatch. On Friday, May 18, RESERVE delights a limited gathering of wine and food lovers with Library, Reserve, White/Rosé, and Barrel Sample wines, complemented by fresh and local gourmet bites. The following day, Saturday, May 19, begins with a Winemaker Seminar. Five winemakers sharing their vintage stories about a uniquely named wine that is a perfect example of the Paso Robles region. The day culminates with the Wine Festival Grand Tasting in the Paso Robles Downtown City Park. This unique outdoor tasting features 70+ wineries arranged by “regions” (Bordeaux-style, Rhône-style, Zinfandel, Burgundian-style, Italian varieties and Other Wild Wines) with wineries pouring their best. In the picnic area and gazebo, live music will provide the perfect atmosphere to enjoy a beautiful summer day sipping Paso Robles wines. Back by popular demand, the 2018 Wine Festival will feature complimentary food tasting from the region’s best chefs and caterers. Visit www.pasowine.com often to see updates on who will be sampling their delicious creations. Creativity abounds with the return of a limited lineup of handpicked artisan merchants. These entrepreneurs will offer a selection of unique local and wine country themed products. Sunday, May 20 of Wine Festival weekend encourages people to travel beyond the Park to explore more than 100 winery events throughout the weekend including winemaker dinners, live music, barrel samples, and so much more! Tickets – All Blendfest on the Coast, Zinposium, Z After Party, Wine Festival Winemaker Dinners, RESERVE, Wine Festival Seminar, and Wine Festival Grand Tasting Tasting tickets are now available on www.pasowine.com. Guests staying in Cambria and San Simeon lodging can enter each session 30 minutes early with the presentation of a room key. During Paso Robles Wine Country event weekends, visitors and locals alike are encouraged to travel beyond the park to visit the more than 100 wineries that host special activities including winemaker dinners, food pairings, barrel tastings, winery and vineyard tours, and much more. 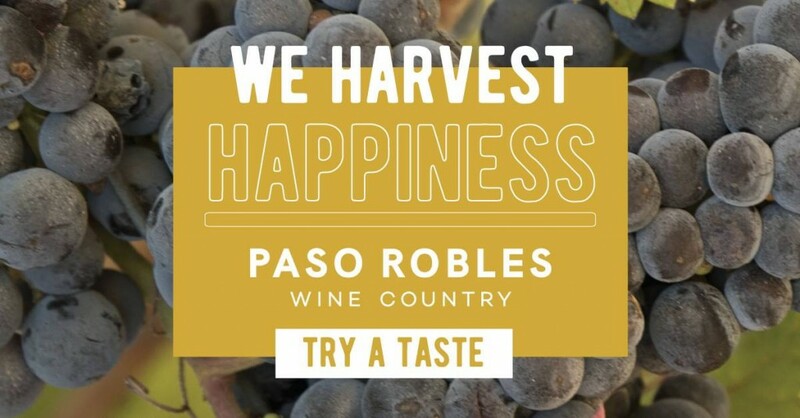 Visit www.pasowine.com to plan a complete Paso Robles Wine Country experience, including lodging, restaurants, transportation, and more things to explore. In paying my annual dues to NASA there are many opportunities offered for continued education and tastings. And now that NASA President Diego Meraviglia is the US Brand Ambassador for Dom Perignon, it was just a matter of time before I could get in on the most rare opportunity! “Brothers come quickly ! I’m drinking stars !” was the exclamation uttered by father Dom Pérignon as he discovered bubbles in wine. A fluke, a coincidence of nature dictated by the extreme Northern location of the Champagne region causing stuck fermentations due to cold. He spent the rest of his life, 47 years, battling, studying, exploring, analyzing and comprehending this phenomenon. In 1668 Dom Pierre Pérignon, a monk, is nominated curator of the abbey of Hautvillers. He was in charge of managing the supplies of this holy place and set out to improve and renovate the vineyards and wine the abbey produced. As a Benedictine monk, he followed the rule of St.Benedict…the strive for perfection and discipline; he left nothing to chance. He set out to make “the best wine in the world” and single handedly set the base for what Champagne and any ‘classical method’ sparkling wine is today. He invented techniques, methodologies and concepts that revolutionized wine forever. The original prestige cuvée was indeed Moët & Chandon’s ‘Dom Pérignon’, launched in 1936 with the 1921 vintage. Until then, Champagne houses produced different cuvées of varying quality, but a top-of-the-range wine produced to the highest standards (and priced accordingly) was a new idea. In the last three decades of the 20th century, most Champagne houses followed these with their own prestige cuvées, often named after notable people with a link to that producer and presented in non standard bottle shapes (following Dom Pérignon’s lead with its 18th century revival design). These are indeed…the BEST SPARKLING WINES IN THE WORLD. SEMINAR PRESENTED AND LED BY DOM PERIGNON US BRAND AMBASSADOR & NASA PRESIDENT, DIEGO MERAVIGLIA. Dom Perignon is known for being the first to: put a brand name (his own) on a label (instead of just the name of the region), creating the bottle shape, making white wine from red grapes, blending and sorting (and at Dom Perignon every berry is sorted by hand). Ruinart is known for being the first commercial winery in Champagne. Veuve Cliquot is known for being the first to filter. Dom Perignon came to the abbey in 1668, at the age of 32, and was given the job of curator. He dedicated 47 years of his life to perfecting wine. Wine in Champagne, France first appeared between the first and fourth centuries AD, when the Romans ruled the area. After that, during the Barbarian rule, there was no wine produced until 987 AD. Champagne is the most northern region of France. There is less sunlight and thereby less warmth in the vineyard. Every year, to this day, it is a struggle for the grapes to ripen. There is spring frost and winter hail, so the “struggle is real” in producing Champagne, and also accounts for the cost. Belgium is a bordering country but they’re not known for producing any wine at all, they make beer. 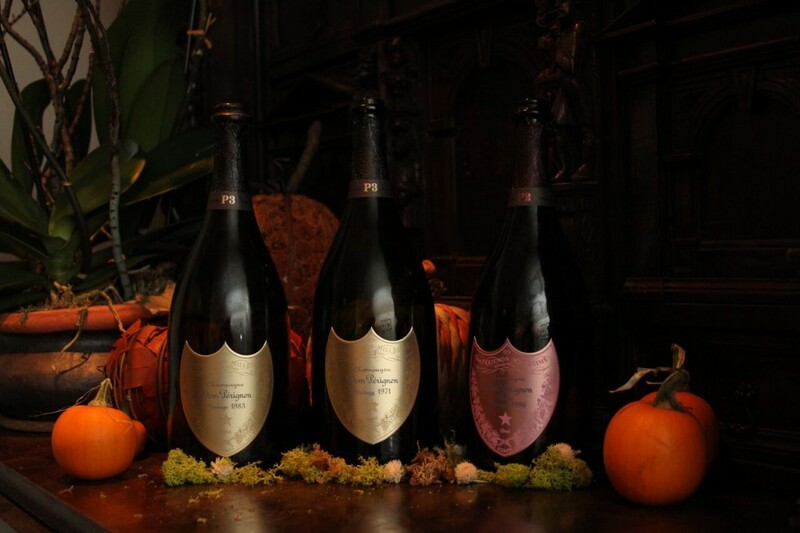 Dom Perignon only uses a strict 50/50 blend of Pinot Noir and Chardonnay. The chalky fossil-rich soil in Champagne, due to originally being under the sea, gives the wines their minerality. 1921 was the first vintage champagne from Don Perignon. It was all non-vintage prior to this. To this day they don’t make a vintage champagne every year, only the years that the fruit is the best. Stay tuned to this column next week where I will share some of the wonderful and rare wines we tasted after our lesson! This is the last article in my series on the Napa Valley for 2017. Today we will have a virtual taste from Phifer Pavitt, Tank Garage Winery, Larkmead and Joseph Phelps. We met with Luke Speer, the Director of Hospitality, for our tasting. 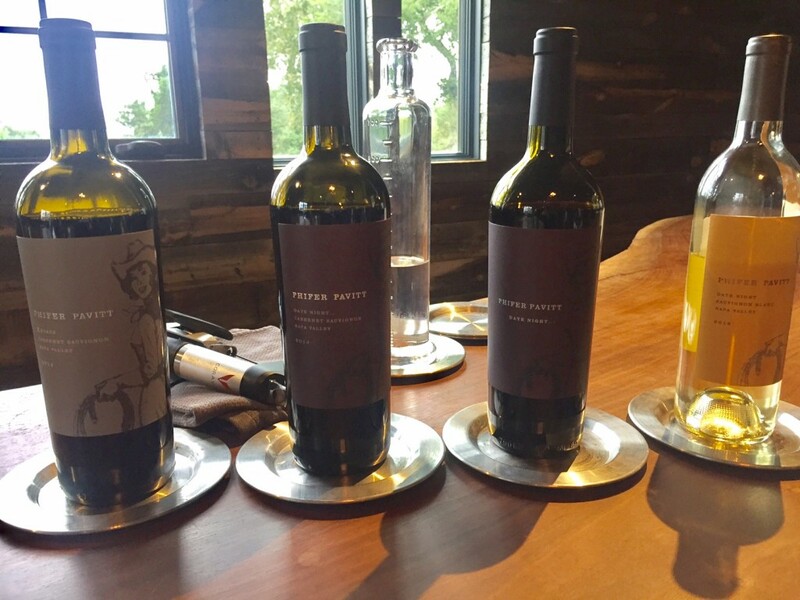 Phifer Pavitt is known (written up in Wine Spectator 13 times so far) for their “Date Night” Cabernet Sauvignon and Sauvignon Blanc. New for them: the XRoads Cabernet Sauvignon. A sparkling has recently been added but, woe is me, none was available for tasting during our visit. We began with the 2016 Phifer Pavitt Sauvignon Blanc – fresh, crisp, lemon-lime, fleshy peach with low acid and a long finish. I’m partial to this wine as I’ve known the winemaker before he made commercial wine and have been a longtime fan: Gary Warburton. Next we tried the 2013 Date Night – It was big, dry and tannic with exceptional plump blue to black fruit, fig, smoke, aromatic and perfumy. Their red winemaker Ted Osborne always does a great job. Now onto the 2014 Date Night – I got a bit brighter fruit than I did from the 2013, but with the same plumpness. Very well done. The 2014 XRoads Cab had great fruit from the valley floor: red fruit, dried blueberry, black cherry, and very balanced with the tannins. Destined to be a hit. Can’t recall exactly where I heard about the Tank Garage Winery, but it was either via a wine trade or marketing magazine. I had read it was a unique space with a unique brand. What I discovered is that this is a must stop for those looking for a different experience, or those new to wine looking for some fun. 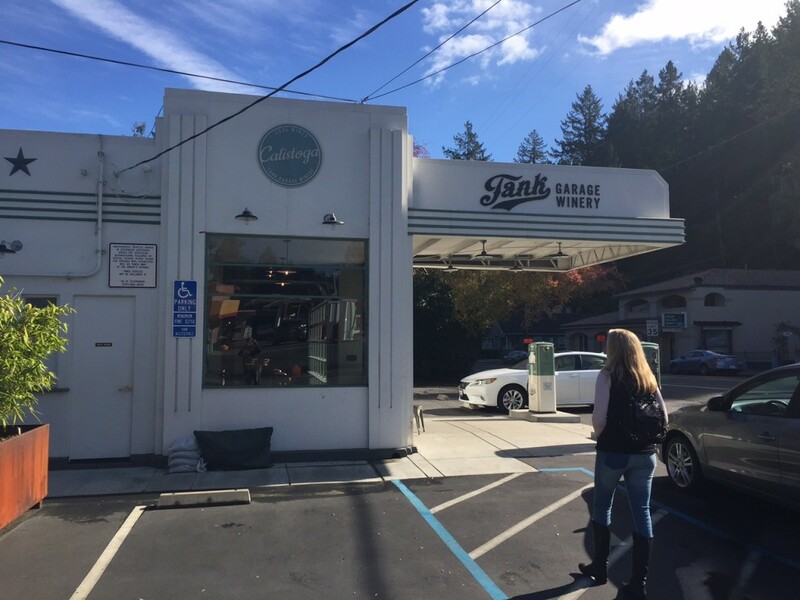 Turned a 1930s era filling station into a tasting room and…a cozy Speakeasy in the back for members only. The wines are all one and done. Each release is an all new blend, name and package. The official motto is actually “Never Dream Alone” and they’ve “found a ton of amazing people to dream” with them. All of their wines are in fact small batch. At one point, they were all under 125 cases, but as they’ve grown, some are as large as 500 cases, like their brand new Chrome Dreams. They have four wines that are distributed at larger production including a Rosé, Chardonnay, Cab and Red Blend called All or Nothing, which is primarily Zin, Cab and Petite Sirah. The Wine Club has three levels, 3-Bottle, 6-Bottle and 12-Bottle. The Half-Tank and Full-Tank options are just for purchases in the tasting room. 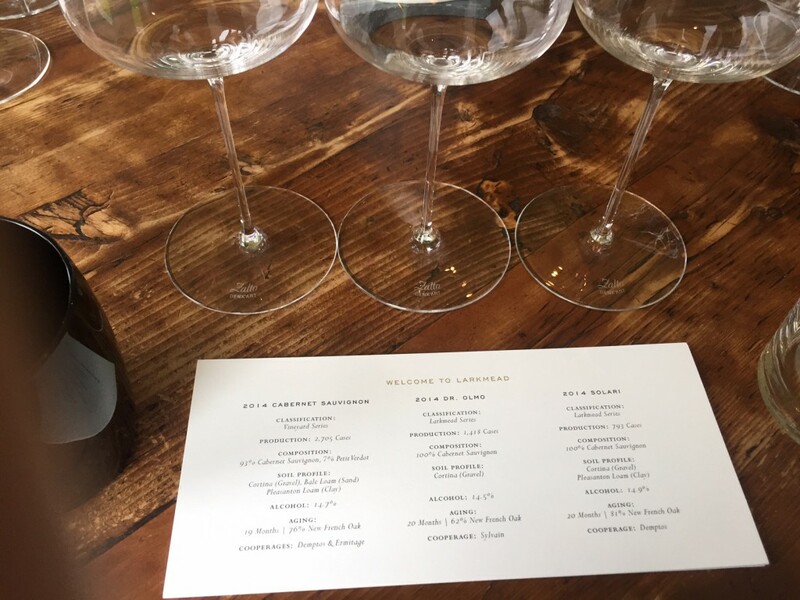 The wines we quickly tasted through (I didn’t make an appointment and had another coming up) included a 2016 “California Stroke” White Wine, California, 92% Vermentino with 8% Verdelho, skin fermented; 2015 “Nothing Gold Can Stay” 100% Chardonnay, Napa Valley, 40% new oak and 60% neutral; 2015 “Like You Stole It” Red Wine, Contra Costa County, blend of Mourvedre, Grenache and Carignane; 2015 “Take It Easy” Red Wine, Sonoma County, a blend of 96% Zinfandel, 3% Petite Sirah and 1% Carignane; 2014 “The Heavy” Red Wine, Napa Valley – the only label that stays with each vintage – and a blend of 73% Cabernet Sauvignon, 20% Merlot and 7% Cabernet Franc. Jeff Smith from Hourglass suggested we make a reservation to taste at Larkmead. Beautiful tasting areas both inside and out, we snagged a couch and settled in for a few tastes. We did learn that the vineyards were established back in the 1800s and the first vintage came in 1930s! Look up Lillie Hitchcock Coit (yes, of Coit Tower fame) to sleuth around more. Lillie had a wild life before she died in 1929. She was the first female volunteer firefighter and sold grapes to churches during prohibition – among other things. The wines are “heavily allocated” to loyal members. Though all from the valley floor the vineyards have a diversity of soils and gravel. One vineyard, the Dr. Olmo, is named after the famed UC Davis Dr. Olmo that is credited for fighting Phylloxera. We tasted three wines: 2014 Cabernet Sauvignon was all mature developed fruit, velvety soft, pepper and nicely balanced black currant, black plum and black currant with crushed black pepper and spice. The 2014 Dr. Olmos started with that barnyard nose with the addition of dark chocolate and blackberry while the taste was dry with layered black fruit and tasted oak. The final wine, the 2014 Solari Cab had that barnyard funk, prune, ripe berries, dusty, mint and tannin. The lingering length on this one made it our favorite. The benefits of membership: calling to make an appointment as you park the car in their lot! We had just received our allocation but my hubby wanted to taste the new Insignia before we put it away for a few years. We got to try more than that, and as I wasn’t “covering” the winery I just wanted to at least give their wines a shout out, sans tasting notes, as I’ve never ever been disappointed with Joseph Phelps: 2014 Pinot Noir, Pastorale Vineyard, Sonoma Coast; 2014 Pinot Noir, Quarter Moon Vineyard, Sonoma Coast; 2014 Cabernet Sauvignon, Napa Valley; 2012 INSIGNIA, Napa Valley (I did note this one as “perfect”); 2014 INSIGNIA, Napa Valley; and a 2015 INSIGNIA, Napa Valley, barrel sample. Last but not least we had the opportunity to try another winery new to us: Switchback Ridge. Their 2014 Switchback Ridge Merlot gave off that interesting funky barnyard nose, saddle leather at first. Some of that blew off and I got good dark fruit while the 2014 Switchback Ridge Cabernet had pungent thick fruit that softened in the glass, a bit of mint and licorice on the nose as well. In the mouth I tasted layers of blackberry, black cherry, cigar, oak and tannin. Bob Foley makes these two wines. When we taste, he is very eager for our impressions, our reactions. He watches our faces, especially our eyes, carefully. He is clearly proud of how old the wines are: 2004– it was so fresh; I knew that it was not a 2016 from barrel, but perhaps a 2015? No, 2004; bottled in 2010. Totally fresh, punchy, dense but light on its feet at once. Bottled in 2008. Equally fresh. Showing the beginning of what you could call bottle age. Then, he pulls out and pours a wine that is slightly golden by comparison– 1999. “The first wine that I ever made.” We cannot believe that he is sharing a bottle with us. This wine too is absolutely fresh, vigorous, even electric. The wine is perhaps more viscous than the others, and more golden to the eye– but not tired or even maturing in the mouth. The wines are complete and developed– and in this sense, mature– but there is no sense that the first two wines have aged at all, and it is hard to place the bottles in time in any way. They are, in this respect transcendental, which is difficult for wine– but they have dates. 1999 was the first year that I made wine too; it is hard for such a wine not to seem historical in this respect. How can a winemaker’s first wine not be historical? We taste a red wine from 2004 and another early white, from 2001, that finished primary fermentation in bottle (by surprise). Both wines were very good, even great in some way– but it was so hard to come back and down from the 1999, the wine of origin. He calls all of the wines: “Genèse”– Genesis. The winery is the Gardens of Emeralds; the wines are Genesis White and Genesis Red. All of the wines have intensity– particularly in what you might call “minerality.” They are saline and have the body and density that comes from fruit– but they do not taste or smell of fruit. Nor do they smell of yeast, in spite of their long lees contact. Nor do they seem oxidized. Even the 1999, opened 15 days ago, was fresh and yellow– no more golden than many Chenins only a couple of years old. You could say that the wines are rocky– but you must somehow also mean that they are graceful. You could point to nuts and nut skins, and high-acid, young champagne, but you would have to be careful not to simplify too much. It is also worth saying that the wines taste and smell reduced, but that this is not an overwhelming sensation; and that there is no trace of VA at all, or, at most, perhaps one senses some acetic in the mouth, but nothing else, and certainly nothing acetate-y. The wines do not have the markers of wines that stand out as “natural” and seem utterly classical in spite of their unconventional origins. Lastly, the wines have no typicity for me. I cannot identify the whites as Chenin (though they are not so far from what Eben Sadie sometimes accomplishes by rather different means). I cannot place them as Loire wines. This does not bother Xavier at all. He is in fact proud of this. Even though he is a super careful farmer, he is not interested in revealing or somehow representing the vineyards. There is clearly an unbroken continuity for him between the vines and the wine, but he nonetheless does not feel that he respects this continuity by seeking typicity, or by making single vineyard wines. Neither holds any interest for him. He suggests, with both pride and mischief in his eyes, that the wines would be hard to identify in a blind tasting. When I agree and tell him that the 1999 reminds me of old first growth Bordeaux, he is clearly pleased– not because he cares at all about old Bordeaux, but because my mind roamed.